Cambodian Prime Minister Samdech Akka Moha Sena Padei Techo Hun Sen received here this afternoon at the Peace Palace visiting Parliamentary State Secretary to the Federal Minister for Economic Cooperation and Development of Germany H.E. Norbert Barthle. H.E. Eang Sophalleth, Assistant to the Cambodian Premier, told reporters after the courtesy meeting that H.E. Norbert Barthle led a group of German lawmakers and government officials to visit Cambodia to learn about the impacts of Germany-funded projects in Cambodia to serve as the basis for future cooperation with Cambodia. H.E. 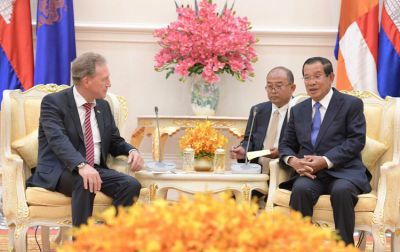 Norbert Barthle noted the strong development of Cambodia and the presence of many investors in the country, affirming that German businessmen are also interested in investing in Cambodia. In reply, Samdech Techo Hun Sen expressed thanks to H.E. Mrs. Angela Merkel, the Chancellor of Germany, for her congratulatory message to him after the national election last year. The Cambodian Prime Minister also briefed his guests on the past and current situation of Phnom Penh capital and Cambodia and the priority sectors, including human resources, irrigation, communication and telecommunications, and electricity.